The official weigh-in for the next installment of the Premier Boxing Champions series headlined by the rematch between former Welterweight world champions Victor Ortiz and Andre Berto took place on Friday in Carson, CA. The official weights for the entire card are as follows. Main Event: Welterweight – 12Rds. Victor Ortiz 146lbs. vs. Andre Berto 146lbs. Edwin Rodriguez 177lbs. vs. Thomas Williams Jr. 176lbs. Fernando Montiel 125lbs. vs. Jorge Lara 124lbs. Eddie Chambers 216lbs. vs. Gerald Washington 239lbs. Jr. Middleweight – 10 Rds. Terrell Gausha 154lbs. vs. Orlando Lora 154lbs. David Benavidez 167lbs. vs. Phillip Jackson 169lbs. Jr. Lightweight – 6 Rds. Manny Robles 127lbs. vs. Rafael Reyes 130lbs. Adan Mares 134lbs. vs. Jesus Aguinaga 133lbs. Anthony Flores 143lbs. vs. Brian Jones 142lbs. Jr. Welterweight – 6 Rds. Luis Bello 139lbs. vs. Darryol Humphrey 138lbs. PBC: Ortiz-Berto II takes place tonight (Saturday, April 30th) at the StubHub Center in Carson, CA. The card will be televised in the United States by Fox at 8PM ET/5PM PT. Check your local listings for time and channel in your area. Check your listings internationally. For more information on the Premier Boxing Champions series please visit: www.premierboxingchampions.com. We would like to let our readers know that new material will be released on Saturday, April 30th. Stay tuned. "And That's The Boxing Truth." 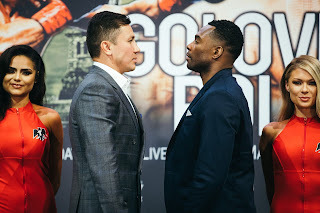 On April 23rd at The Forum in Inglewood, CA undefeated unified WBA/IBO/IBF Middleweight world champion Gennady Golovkin climbed into the ring to make the sixteenth defense of his world championship against undefeated IBF mandatory challenger Dominic Wade. The question going into this fight was the same as virtually every previous Golovkin title defense. Would Golovkin’s opposition be able to provide the world champion with a significant test? What would happen in this fight would be almost a classic example of a fighter taking full advantage of an opening left for him by his opponent. Golovkin dropped Wade with a right hand at the end of the first round and subsequently scored two more knockdowns in the second round to earn his twenty-second consecutive knockout and successfully defended his championship over a “Game”, but over matched challenger. Prior to this fight, this observer discussed Dominic Wade’s ability to box and use lateral movement in saying that it would be interesting to see whether Wade would be able to work behind a consistent jab and use his movement to offset Golovkin’s steady pressure. Although the challenger was more than willing to let his hands go in this fight, he opted to not use much lateral movement and allowed the champion to dictate how the fight was fought. What was more troublesome for the challenger was that he could not land anything to discourage Golovkin from coming forward. As has been the case several times throughout Golovkin’s championship reign once he saw his opening the end came sudden and quick. Even though this was not a one punch knockout, once Golovkin scored the first knockdown of the fight it seemed as though it is only a matter of time as Wade really did not have an answer to first recover and second combat Golovkin, who sensed he had his challenger in trouble. The first of the three knockdowns in this fight came as a result of a right hand that seemed to land behind the ear, but was ruled correctly a knockdown as Wade was turning away from the punch as Golovkin threw it. Wade appeared to go down awkwardly and never seemed to recover from the first right hand. In the second round Golovkin continued to apply pressure and landed some very effective punches the body of Wade, which set up the challenger to go down for the second time as a result of a right hand to the head and it was Golovkin’s right hand that would subsequently finish the fight moments later as he knocked Wade down for the count for a third and final time. Although this fight ended up being a mismatch, it was another demonstration of not only Gennady Golovkin’s devastating punching power, but the systematic approach in how he executes his offense. Prior to this fight, this observer also discussed the potential of a lucrative fight that might be on the horizon for Golovkin against the winner of the upcoming WBC Middleweight world championship fight between champion Saul Alvarez and former Jr. Welterweight world champion Amir Khan. As some Boxing fans might know in addition to holding three of five recognized world championships in the Middleweight division, Golovkin also holds interim championship status in the World Boxing Council’s (WBC) Middleweight ratings per his victory in a title defense over previous WBC number one contender Marco Antonio Rubio in October 2014. This theoretically should entitle him to a fight against the WBC world champion in what would be a unification bout. Although readers have heard me state in the past that Golovkin’s interim status does not mean much as he is already a unified world champion, I believe it is time for the World Boxing Council to step in and ensure that Golovkin gets the opportunity to face the winner of Alvarez-Khan after not getting the opportunity to face Alvarez following his world championship victory over Miguel Cotto in November of last year. Even though there has been some discussion among both Boxing fans and experts alike as to whether or not a potential fight between Golovkin and Alvarez would indeed take place at the 160lb. Middleweight limit or if a fight between the two would take place at a “Catchweight”, this observer believes as an old school Boxing historian and enthusiast that if a fight between two were to occur it should be at the official Middleweight limit. It is no secret to longtime readers or those that I have the pleasure of talking Boxing with on a regular basis that I am not a fan of “Catchweight” fights where more often than not fighters who compete at a lower weight class will fight against a fighter who has competed in a higher weight class, but will force that fighter to come down in weight in order for the fight to take place. I am one who believes that if a fighter who has fought in lower weight classes wants to compete against those who have fought in a higher weight class they should do so at that higher weight. The bottom line is it does nothing for a fighter who has fought in a lower weight division by fighting someone who traditionally fights in a higher weight class at a weight lower than where that fighter usually competes. Even if the fighter who has fought in a lower weight class wins the “Catchweight” fight it does nothing as theoretically the naturally bigger fighter will have fought at a weight where they are not as strong and are thus compromised. After all, many of the legendary fights involving fighters who were moving up in weight to face a world champion at a higher weight division did not involve “Catchweights” and if the fighter who was moving up in weight emerged victorious they were often given more credit for their accomplishment than has been the case in recent times with “Catchweight” bouts. A more cynical point of view just might be that financial figures are often considered the more important factor as to where a fight takes place in terms of the weight scale. In October of last year undefeated unified WBA/IBO Middleweight world champion successfully made the fifteenth defense of his world championship by continuing his quest to fully unify the Middleweight division by stopping IBF world champion David Lemieux in eight rounds and in doing so added the IBF world championship to his unified crown. It was not only Golovkin’s fifteenth successful title defense in a reign that began in 2010, but also the champion’s twenty-first consecutive knockout. Readers may recall following Golovkin’s dominating win over Lemieux last October this observer stated much as I have after several of Golovkin’s world title defenses that it is time for Golovkin to face a fighter who is considered a marquee star in the sport. I also stated after his victory over Lemieux that even though there were two other world champions in the division besides him that it is hard to argue against Golovkin’s statistics as being the number one fighter in the Middleweight division. Golovkin’s victory over Lemieux also put him five successful title defenses away from tying the all-time record for most successful Middleweight championship defenses set by Bernard Hopkins from 1995-2005 of twenty successful defenses. Despite my opinion that Golovkin has more than earned his chance to show what he can do against a fighter considered to be a star in the sport, he has not yet secured that chance as the next chapter in Golovkin’s reign as unified Middleweight world champion will take place on Saturday night at The Forum in Inglewood, CA against undefeated contender Dominic Wade, who is currently rated number three in the world by the International Boxing Federation (IBF) and number eight by the World Boxing Council (WBC). Although Wade will enter into this fight unbeaten with a record of 18-0, with 12 Knockouts, he will likely be considered a significant underdog against the champion, who enters with a record of 34-0, with 31 Knockouts and has a career knockout percentage of 91%. The challenger Wade will however, enter coming off of his most significant victory, a ten round split decision in June of last year over longtime division cornerstone and former world champion Sam Soliman. Even though some might say that this fight will do little in terms of getting Golovkin in position for a marquee fight perhaps later this year, the danger in any fight regardless of the opposition is the potential of a world champion taking his opponent likely. As Golovkin has continued to carve out what this observer has called a path of destruction through the Middleweight division he has never shown any sign of treating an opponent as a mere afterthought, but after twenty-one consecutive knockouts and virtually dominating all opposition placed before him one might wonder if the struggle in securing a lucrative fight against a marquee star has taken a toll on him. This observer also stated following the Lemieux fight that the most logical option was for Golovkin to face the winner of last November’s WBC world championship fight between Miguel Cotto and Saul Alvarez. Following Saul Alvarez’ victory over Miguel Cotto last November, I stated it would be logical to assume that a battle between he and Golovkin might be in the near future especially given that Golovkin also holds interim championship status in the WBC’s Middleweight ratings and said whether or not the WBC would in fact mandate a fight between the two to take place sometime this year remains to be seen. As most Boxing fans know, Alvarez will make the first defense of his WBC world championship on May 7th against former Jr. Welterweight world champion Amir Khan at the new T-Mobile Arena in Las Vegas, NV in a fight that will be broadcast by HBO Pay-Per-View in the United States. It will be interesting to see should Golovkin successfully defend his title on Saturday against Dominic Wade whether or not the WBC will announce that it will mandate the winner of Alvarez-Khan to face him. As for Dominic Wade he does not have the possibility of a fight against the winner of Alvarez-Khan to worry about. Wade is a fighter with good lateral movement and hand speed. The question for Wade is essentially the same that has been asked of every previous Golovkin opponent. Can Wade provide a significant test for the champion? As virtually every previous opponent of Gennady Golovkin has found out, it is not an easy task to deal with a fighter who is not only a “Knockout Artist”, but is one that executes his fight plan in such a tactical measured way that few fighters have been able to go the distance against. It will be interesting to see if Wade, who can box and has the ability to throw many punches per round will be able to work behind a consistent jab and use his lateral movement to offset Golovkin’s steady pressure. Fighters such as Willie Monroe and former Middleweight world champion Daniel Geale each had the movement that some felt would give Golovkin problems, but were ultimately unable to land anything to discourage Golovkin from coming forward. The key to this fight in my eyes will be if Wade can find a way to offset the champion from the outset and nullify Golovkin’s pressure. It is important that Wade continue to box even if he is able to win a couple of rounds against Golovkin. He must be an elusive target and not allow the champion to cut the ring off and trap him where Wade’s lateral movement might be nullified. As for Golovkin is logical to assume that he will look to apply pressure from the outset and back Wade up. Golovkin is a fighter who can knockout opponents with either hand and has also shown the ability to take a punch as was the case against Daniel Geale when he absorbed a flush right hand to the head while throwing his own right hand, which would not only land flush, but knocked Geale down and subsequently ended the fight. Whether or not Dominic Wade will be able to put together a fight plan that will have success against a fighter who has continued to compile a lengthy list of knockout victims and pull off what most would consider a significant upset remains to be seen. As for the champion this title defense of his WBA/IBO/IBF Middleweight world championship is another chapter in what could be a historical reign when all is said and done. Gennady Golovkin should remember however, that even though a lucrative fight may be on the horizon for him against a marquee star of the sport, his focus should squarely be on the fighter standing across the ring from him on Saturday night. Golovkin vs. Wade takes place Tonight, (Saturday, April 23rd) at The Forum in Inglewood, CA. In the United States the fight will be televised by HBO Sports at 10 PM ET/7 PM PT. Check your local cable/satellite provider for time and channel in your area. In the United Kingdom and Ireland the fight can be seen on BoxNation at 2 AM (Sunday April 24 Local UK Time) for more information please visit www.HBO.com/boxing or www.BoxNation.com. Check your listings internationally. Showtime Sports’ popular ShoBox series has carved out a reputation as a proving ground for prospects in the sport of Boxing as they look to advance from prospect, to contender, to world champion. It is always interesting with each ShoBox card to see which fighters may stand out as a potential contender down the road. The series’ most recent edition took place on April 15th at the Turning Stone Resort and Casino in Verona, NY. This card featured a tripleheader in Boxing’s Bantamweight, Lightweight, and Cruiserweight divisions. The card kicked off with an eight round Cruiserweight bout between unbeaten prospects Alexey Zubov and Constantin Bejenaru. Although historically the Cruiserweight division is seemingly always lacking mainstream attention in the sport particularly here in the United States, this was an interesting fight between two fighters at similar stages in their development as each fighter entered the bout unbeaten in ten professional fights. The nearly 6’2 Zubov had a significant height and reach advantage over the 5’10 Bejenaru, but the story of the fight was how well Bejenaru was able to pick his spots by using lateral movement to quickly get on the inside Zubov’s reach, throw punches in short spurts of combinations, and then get out at a safe distance where Zubov was not able to be effective. Zubov simply could not find a way to get the ebb and flow of the fight to move in his favor as Bejenaru was able to dictate how the fight was fought. Zubov was able to score a knockdown of Bejenaru with a short right hand early in the seventh round, but simply was not able to sustain much of an offensive rhythm throughout the fight as Bejenaru went on to earn a convincing eight round unanimous decision. Although one should remember that these were two fighters who were competing in the eleventh professional fight, this should be viewed as a development fight for both fighters. Even though Bejenaru won this fight convincingly and dominated the action in this observer’s eyes, he will likely look at his performance and look for ways to improve as most fighters do. As for Alexey Zubov, this loss could be a temporary setback for him and perhaps he will be able to improve on being able to be more offensive against an elusive target as Bejenaru was in this fight. The second fight on this card took place in the Lightweight division between unbeaten prospect Eudy Bernardo and veteran Mason Menard. Bernardo, who entered the fight with a record of 21-0, with 15 Knockouts was stepping up in the level of his opposition against Menard, a fighter who had only lost one of thirty-one previous professional fights and who was ranked in the top fifteen in the World Boxing Association’s (WBA) Lightweight ratings. A question that might be asked of an unbeaten prospect who has amassed an impressive record against limited opposition is how that fighter will perform as they step up in caliber of opposition. The story of this fight however, would not be about how a fighter would do against a different caliber of opponent than he had previously faced, but rather the condition of one of the combatants. Much as was the case in the first fight of this tripleheader this was a case of a shorter fighter in Menard dictating how the fight was fought and bringing the fight to the taller Bernardo. Menard was able to apply pressure on Bernardo and drop him in the second round with a right hand to the head. Although Bernardo was able to get up from the knockdown, it would be what happened in the third round that would cause concern. Menard connected with another flush right hand to the head of Bernardo sending him down to the canvas out cold as the fight was immediately waved off by Referee Benjy Esteves. Bernardo was taken from the ring on a stretcher and taken to a nearby medical facility as a precaution, but was reportedly awake and responsive. Although Menard’s performance was extremely impressive and will likely earn him an opportunity against someone who is rated in the top ten in either the WBA or another sanctioning organization’s respective Lightweight ratings, the brutal knockout that took place in this fight is a reminder of the dangers associated with combat sports and it should not be overlooked how quickly precautions were taken and for Eudy Bernardo to be attended to by medical personnel at the venue where this card took place. We have seen far too many tragedies in the sport of Boxing and thankfully this fight did not have a tragic outcome. The main event of this card was a battle for the vacant North American Boxing Association (NABA) Bantamweight title between undefeated prospects Nickolay Potapov and Stephon Young. This was a highly competitive battle where both fighters had periods of effectiveness. In many ways, this was the definition of what a close fight should be. Potapov was often the more busy of the two fighters, while Young was most effective landing one punch at a time, but those punches were often the harder and cleaner punches thrown by either fighter. When it comes to close fights where there are many “Swing Rounds” it is intriguing to see how the three official judges will score a fight. Although as I have often said over the years that when it comes to close fights it will often boil down to what a judge prefers in their own criteria based on clean punching, effective aggressiveness, ring generalship, and defense, there really was not much to separate Potapov and Young in this fight as after ten rounds two of three official judges scored the fight a draw. When all was said and done this card did provide a look at some potential prospects and also some fighters who suffered career setbacks and perhaps setbacks that were possibly career ending. It would not surprise this observer to see any of the fighters featured on this card taking part in a future ShoBox card in the future. Although much of the focus coming out of this card is obviously centered on the condition of Eudy Bernardo and naturally questions will be asked as to whether he will be able to resume his career after suffering a knockout loss in such brutal fashion, it will be interesting to see what the other fighters who were on this card can do going forward. Whether or not fighters such as Potapov, Young, Menard, Bejenaru, and Zubov will be able to make the transition from prospect, to contender, to world champion remains to be seen. It will nevertheless be interesting to see how each fighter progresses as they attempt to advance in their careers. The official weigh-in for Friday night’s Showtime Sports’ ShoBox: The New Generation card took place on Thursday in Verona, NY. The official weights for the entire card are as follows. Main Event: Bantamweight – 10Rds. Nikolay Potapov 117lbs. vs. Stephon Young 116lbs. Eudy Bernardo 135lbs. vs. Mason Menard 135lbs. Alexey Zubov 198lbs. vs. Constantin Bejenaru 198lbs. ShoBox: Potapov vs. Young takes place tonight (Friday, April 15th) at the Turning Stone Resort and Casino in Verona, New York. In the United States, the card will be televised by Showtime Sports at 10PM ET/PT. Check your local cable/satellite provider for time and channel in your area. Check your listings internationally. Tickets for this card are still available and are priced at $25, $35, $60. Call 1-877-833-7469 or visit www.turningstone.com for more information. The biggest story in Boxing’s Heavyweight division continues to be Tyson Fury’s upset victory over long-reigning unified IBF/WBO/WBA/IBO Heavyweight world champion Wladimir Klitschko in November of last year. Sometimes when a longtime champion is defeated after unifying portions of a world championship in a given weight class what can unfortunately happen is the politics of the sport can play a role not only in regard to a potential rematch, but also in regard to whether or not a sanctioning organization chooses to sanction that rematch for its version of a world championship. It became apparent shortly after Fury’s victory over Klitschko that there would be an issue with regard to the International Boxing Federation (IBF) and its version of the World Heavyweight championship. This was due to IBF number one contender Vyacheslav Glazkov being next in line for a mandatory title defense for the winner of Klitschko-Fury. Klitschko’s option for an immediate rematch however, meant that Glazkov would either have to wait for the winner of the rematch or for the IBF to strip Tyson Fury of its world championship and thus enable Glazkov to fight for the vacant championship. As most Boxing fans know, Klitschko invoked his option for an immediate rematch a few days after he lost to Fury. Fury being contractually the obligated to face Klitschko in that immediate rematch was thus unable to fulfill his commitment as far as the IBF was concerned. The International Boxing Federation subsequently stripped Fury of the IBF Heavyweight world championship and sanctioned a fight in January of this year between Glazkov and Charles Martin for the vacant IBF world championship. Whenever two fighters meet each other in a fight for a vacated world championship it is not unusual for either fighter to be criticized or for the sanctioning organization in question to be criticized for sanctioning the fight for a world championship by fans or experts. Even though the fight between Glazkov and Martin pitted two undefeated Heavyweights against each other, the fight was treated with little fanfare and was in fact on the undercard of another Heavyweight world championship fight between undefeated WBC world champion Deontay Wilder and top contender Artur Szpilka. The outcome of the fight between Glazkov and Martin can best be described as “Inconclusive.” Martin was credited with a knockdown in the third round after Glazkov had slipped and went down to the canvas. Glazkov badly twisted his right knee and even though he beat the count was unable to continue due to what was later revealed to be a torn ACL. Martin had become a world champion in rather undistinguished fashion. This led to Martin facing criticism from some Boxing fans, who did not hold him in the regard normally given to a world champion. Martin would choose to make his first title defense nearly three months after winning the title and chose to face another undefeated fighter in knockout artist and IBF number four rated contender Anthony Joshua on April 9th. The American Martin would also choose to face Joshua in Joshua’s home country of England. It was clear that Martin was looking to make a statement in his first title defense against a fighter who had knocked out every opponent he had faced as a professional. Although Joshua entered into the fight having knocked out all fifteen of his previous opponents, he also entered with significant pedigree as an amateur as a former Olympic gold medalist in the Super-Heavyweight division. As a professional, Joshua has only continued to impress having won the British and Commonwealth Heavyweight titles as well as stopping former world title challenger Kevin Johnson for the WBC International Heavyweight title. Although Joshua had steamrolled through all opposition placed before him prior to this fight it was logical to question whether or not he was ready to challenge for a world championship after only fifteen professional fights. It was also logical to wonder whether or not the atmosphere of the event would have a negative effect on him. It was clear however, when the two fighters squared off before a sold-out crowd at the O2 Arena in London, England that Joshua was not fazed or intimidated by the occasion. What would happen in this fight should be described as simply one fighter taking advantage of and executing on an opening his opponent left for him. Joshua began this fight looking like a fighter on a mission as he came out aggressive and almost immediately began looking for a home for his right hand and the process put the champion Martin on the defensive. It was in the second round where the former British and Commonwealth champion would successfully make the transition from contender to world champion. Joshua connected with a flush right hand to the chin of an open Martin sending the undefeated world champion down to the canvas. Although Martin was able to get up from the knockdown Joshua would drop him for a second time seconds later with another right hand. This time Martin, who had gotten up at the count of nine following the first knockdown would misjudge the count following the second knockdown and get up to his feet right at the count of ten. Anthony Joshua had become a world champion with the type of suddenness and devastation that people clamor for in regard to the Heavyweight division. The question now becomes what is next for Anthony Joshua? Although Charles Martin chose to get back in the ring rather quickly after winning his world championship, it is not something that is the norm in this day and age. It is possible that the IBF could sanction an elimination fight to determine a new number one contender for Joshua sometime later this year. If Joshua is intent on climbing back in the ring before a new number one contender can be determined by the IBF there are a few interesting possibilities out there for him. Fighters such as former world champion Bermane Stiverne, Erkan Teper, and former world title challengers Dereck Chisora and Kubrat Pulev may all be viewed as potential options for the new champion. This observer however, believes it is more likely that Joshua may choose to wait on the outcomes of the upcoming WBC world championship fight between Deontay Wilder and number one contender Alexander Povetkin, which will take place on May 21st in Russia as well as the rematch between Tyson Fury and Wladimir Klitschko, which is tentatively scheduled to take place on July 9th in England before deciding on his next opponent. No matter who Anthony Joshua fights next it is clear that he has established himself as the latest player in the Heavyweight division and even though there are fighters both at the world championship level as well as contenders in the division, who may have more professional experience than he does, he is a force to be reckoned with and should be taken seriously by all potential opposition. Although there is no disputing who won this fight and also no questioning as to the punching power of Anthony Joshua, it disturbed this observer to see some fans on social media outwardly criticizing Charles Martin following the fight for what some called an inability to take a punch. Readers who have regularly read my work over the years know that I will always give the benefit of doubt to fighters as they are the ones who get hit by punches. What sometimes gets overlooked by fans however, is that fighters take a risk each time they enter the ring. This especially holds true in regard to the Heavyweight division. Anyone can get caught at any given time and any fighter can have a bad night. An argument can be made that Charles Martin was the victim of bad circumstances when he won the IBF world championship over Vyacheslav Glazkov in such a fashion that left more questions than answers. Many champions throughout the course of Boxing history have won world championships only to lose them in their first title defense. This observer believes that Martin is certainly not done as a contender in the Heavyweight division and it will be what he does following this knockout loss that will determine whether this is a mere bump in the road for him or whether the criticisms that Martin has dealt with both before and after he became world champion were justified. He now has a chance to truly answer those critics by showing he can come back from defeat. If Martin is able to bounce back the possibility certainly exists that he could find himself in a potential rematch against Anthony Joshua down the line. The month of April kicked off with two interesting bouts in Boxing’s Jr. Welterweight and Heavyweight divisions. The first of the two fights took place on April 1st at the DC Armory in Washington, D.C. featured former four-division world champion Adrien Broner. The bout, which was for Broner’s WBA Jr. Welterweight world championship had questions as to whether or not it would in fact take place in the days leading up to the fight. This was due to a warrant being issued for the champion’s arrest for alleged assault and robbery in an incident in January in Broner’s hometown of Cincinnati, OH. Despite the pending charges against him, Broner was granted permission to fight and the bout was allowed to proceed as scheduled. As if questions regarding whether the fight would take place were not enough, Broner would lose his world championship on the scale the day before the fight after failing to make the 140lb. Jr. Welterweight weight limit thus creating a situation where the title would only be on the line for Broner’s opponent Ashley Theophane. Theophane, a former British Jr. Welterweight champion entered into what was his first world championship fight against Broner after competing in forty-six professional fights. Despite the distractions facing the former four-division world champion, failing to make weight, and the subsequent loss of his WBA world championship on the weight scale, Broner was in command from the start. Although Theophane had periodic moments where he appeared to outwork Broner in some rounds, he was unable to land anything to discourage Broner. As the fight progressed it was clear that Broner was fighter landing the harder punches and in the ninth round Broner closed the show stunning Theophane with an uppercut to the body followed by a right hand forcing a stoppage of the fight. It was a performance where one fighter simply did what he had to do in order to win under circumstances where one might argue the odds of performing well may have been against him. Although Broner promptly called out Floyd Mayweather, who was in attendance for a potential fight following his stoppage win over Theophane, the question now becomes what will happen with regard to Broner’s legal troubles before any talk of potential fights can resume. The second bout that kicked off the month of April took place on April 2nd at the Tauron Arena in Krakow, Poland. A Heavyweight fight between former two-division world champion Tomasz Adamek and former Heavyweight world title challenger Eric Molina. The fight, which was for the vacant IBF Intercontinental Heavyweight title was also the second fight for Adamek since losing a ten round unanimous decision Artur Szpilka in November 2014. Molina meanwhile came into the fight off of a sixth round stoppage over Rodricka Ray in October of last year. Molina of course, endeared himself to Boxing fans across the globe in his title shot against WBC world champion Deontay Wilder in June of last year. Although Molina was stopped in nine rounds by Wilder, he more than showed his mettle in defeat and established himself as a contender in the division. The story going into this fight was whether or not Adamek, who had lost two of his previous three fights, would be able to show that he was still a player in the Heavyweight division. In what was a competitive fight, Molina was able to find frequent success in landing his right hand on Adamek over the course of the bout. What impressed me about Molina’s performance in this fight was that although Tomasz Adamek was frequently the busier of the two fighters throughout, it was Molina’s solid defense, ability to withstand Adamek’s aggression, and counter punch effectively particularly with his right hand that gradually became the story of the fight in my eyes as it progressed. It seemed as though the majority of Molina’s offensive moments in this fight were highlighted by the right hand. As the fight progressed, I began to wonder whether or not the difference in the fight would be Adamek’s ability to be aggressive and throw punches in combination, or Molina’s ability to seemingly land the more effective punches if the fight was going to go the distance. Molina would show however, that he had no intention of the bout going to the scorecards. Molina connected with a sudden and flush right hand to the jaw of the former world champion Adamek in the closing seconds of the tenth round sending Adamek down on his back to the canvas. The always “Game” Adamek attempted to beat the count, but he was unable to do so giving Molina a knockout victory in a fight where he was behind on all three official scorecards. Following the fight Molina made clear his intention to face the winner of the upcoming IBF Heavyweight world championship fight between undefeated champion Charles Martin and undefeated IBF number four rated contender Anthony Joshua. The story however, that followed this fight was the announcement by Tomasz Adamek that he hanging up his gloves. Adamek has always given it everything he has each time he enters the ring win or lose and after two world championships in two different weight divisions and winning fifty of fifty-five professional fights if this is the end of the road for Adamek as a fighter he has nothing to be ashamed of and has had a fine career. Whether or not Eric Molina will face the winner of Martin-Joshua remains to be seen. It is clear however, off of what should be viewed as perhaps the most impressive performance of his career, it would not shock this observer to see Molina get another opportunity at a world championship down the line. Although these two fights were not intertwined with each other, the results of the two bouts have produced some interesting questions as to the futures of both Adrien Broner and Eric Molina. We will simply have to wait and see what happens next for both fighters.